While there’s definitely something to be said for full-scale graphic banners and other ultra-flashy marketing accessories for your next trade show or retail set-up, it’s important to note that these are far from your only options. The more you can do to engage with your customer and maximize the space you’re given to work with, the better your results will be! That means thinking small and compact just as much as it does thinking big and splashy when you have the opportunity to. Tabletop displays present a simple and affordable, yet effective way to get your company’s message across to your target audience. Tabletop displays are small, so they really help you make the most of limited counter space when you need to. When used as point of purchase displays, they’re also placed perfectly to catch the eye of passersby and entice them to take a closer look at what you have to offer. Statistics show that businesses and companies who utilize such displays as part of their marketing strategy are more than twice as likely to come away from trade shows and events with convertible leads. That’s not the sort of information any smart businessperson would want to ignore! You can easily customize your displays to switch up the look of your logos, marketing messages, and graphics to better cater to your desired clientele. Instantly send the message you want your customer to have with clear, crisp visuals and dynamic, professional designs. Advertise your company as a complete entity or shine a very effective spotlight on just one or two star products. Because tabletop displays are so flexible and affordable, the only limits on what you can use them to accomplish are those defined by your imagination. If you’re not already using them as part of your retail, trade, and marketing strategies, then it’s high time you started. You won’t believe what they’ll do for your bottom line. When it comes to making your tabletop displays everything that you want them to be, it’s important to hire trained professionals to help ensure a successful campaign. Experienced designers know exactly how to work with your company image and design vision to turn it into something that will really convert. 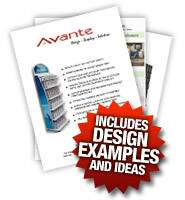 The design and marketing teams behind Avante know the fine art of producing displays that get results backward and forward. Enjoy factory direct services and products that go right from the source direct to you. Minimal production runs are always low. Go as few as 50 units if you prefer. Avante’s services are always cost-effective thanks to factory directness and efficient production practices. Shipping and handling costs are always low, as all shipments are flat-packed and courier friendly for a faster, hassle-free experience. Avante handles every part of the production process so that you and your company enjoy a one-stop, turnkey experience. Professional design, manufacturing, and printing of your product are all performed in-house for better quality control and superior convenience. With Avante in your corner, you’ll enjoy tabletop displays that really help your products stand out from the competition. Order your first custom-designed package today and experience the difference for yourself! Call 250-497-5110 or 1-877-407-8655, request a custom quote or download our catalog today for information about custom designed Point of Purchase displays.